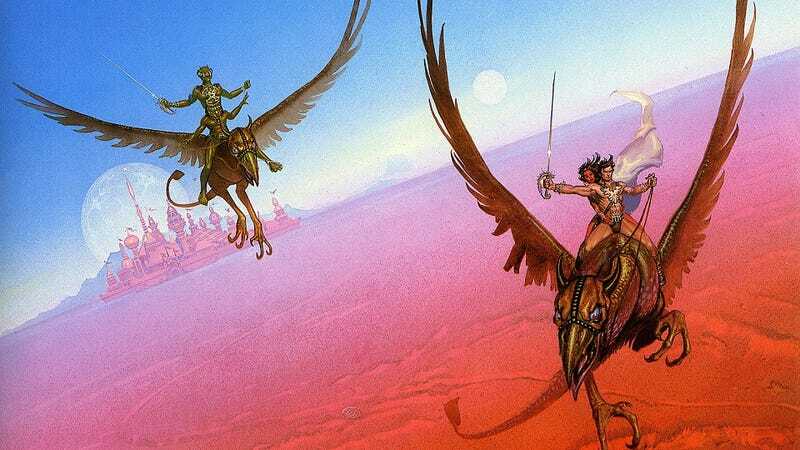 Why does Edgar Rice Burroughs still matter? Edgar Rice Burroughs published his first story, "Under the Moons of Mars," a hundred years ago this month. And even forty years ago, nobody would have predicted that Burroughs' creations, like Tarzan and John Carter of Mars, would still be shaping the entertainment landscape. Why does Burroughs continue to cast such a long shadow over pop culture? All images in this piece by Michael Whelan. The pulp era began with the appearance of the first pulp magazine, Argosy, in 1896, and ended around 1951, when mass-market paperbacks and digest-sized magazines replaced the pulps. As with most historical eras, the borders are amorphous rather than distinct. The dime novel, the dominant form of popular literature in the second half of the 19th century, began its decline in 1894, but it was not until 1919 that more pulps than dime novels were published, and not until 1935 that the last dime novel ceased publication. And the last pulp, Ranch Romances, ceased publishing in 1971, long after the digest form and the paperback had come to rule popular literature. Nonetheless, the pulp era is best marked as lasting from 1896 to 1951. During those years a distinctive aesthetic developed within the pulps. The pulps were a medium, never a genre; every form of fiction appeared within pulp magazines, from railway fiction to sports to adventure fiction. But each of these genres displayed the same aesthetic: an emphasis on sensation, melodrama, adventure and romance and a de-emphasis on the mimetic and realistic; simple emotions strongly expressed; the regular use of the exotic — racial, sexual, socioeconomic, and geographic — and the exploitation of the same; the use of dialogue and narration as means for delivering information rather than displaying authorial style or advancing character development; a privileging of series characters, many of whose situations never changed; and happy endings and good triumphing over evil. The pulp aesthetic was heavily influenced by the aesthetic of the dime novels, the predecessors to pulps which ruled the commercial fiction magazine market in the second half of the 19th century. But in their heyday the dime novels, though as wedded to sensation and melodrama as the pulps, were far more restricted — stylistically, thematically, and in content — by the genre, market, and moral conventions of 19th century literature than the pulps were in the 20th. In nearly every respect the dime novels were Victorian. But the pulps defined their age rather than were defined by it. The movie industry began the same year that the pulps debuted. And like the pulps, movies were primarily influenced by the dime-novel aesthetic. The first major American film serial, The Perils of Pauline, appeared in 1915. (Film serials — movies divided into discrete, separately-broadcast episodes — were more common in Europe at this time). The most common format in both America and Europe was a series of short film, usually about 10 minutes long, about one character. This was true in America (for example, the sixty-seven films about cowboy Broncho Billy which appeared between 1911 and 1915) and France (the thirty films about the mischievous Boireau which appeared between 1906 and 1909). Both film serials and film series were imitating the dime novel format, in which both episodic, issue-to-issue storylines and done-in-one-issue storylines were common. And in both film serials and film series the dime novel aesthetic was dominant: sensational events for the sake of sensation; a preference for action and adventure over plot; no emotions except melodramatic emotions; and no complexity of characters, only simplistic good and evil. By 1914, the film industry had even begun making feature films featuring a dime novel character: Nick Carter (dime novel 1886, first film 1906), Nat Pinkerton (dime novel 1907, first film 1909), and Sexton Blake (dime novel 1893, first film 1909). As would become more common later, the movie industry used dime novels not just as a source for aesthetics but as idea and character factories. During this period Europe led the way in setting the trends in film, but thanks to the burgeoning genre of film journals American filmmakers and movie-goers were quickly informed about what the Europeans were doing. In 1915 the American film industry took the lead in the making of film serials and series, and over the next thirty years — the "Golden Age" of film — dozens of both were made. Three new factors appeared during this period which influenced the pulp aesthetic, and through it the aesthetic of film. The first new factor was the appearance of the new media of radio and comics. The number of films released every year actually decreased, from their 1917 peak of 986, to less than half that by 1950. But with the rise in radio in the 1920s and the rise in comic books in the late 1930s, the number of stories which displayed the pulp aesthetic across media skyrocketed. As with film, there were always exceptions to the use of the pulp aesthetic in radio and comics — more so in radio than in comics — but in general the pulp aesthetic became the standard for genre story-telling regardless of medium. The second new factor was the appearance of a wave of new and very popular characters. Films about Nick Carter, Nat Pinkerton, and Sexton Blake, gave way to films about Dr. Kildare (10 films, 1938-1943), the Three Mesquiteers (51 films, 1933-1953), and Stuart Webbs (50 films, 1914-1930), among dozens of others. These new characters were based on pre-existing characters from radio and the pulps, but the new characters displayed the pulp aesthetic, not the Victorian/dime novel aesthetic. Both major and minor characters became the subject of films, and obscure characters like Frank Spearman's railroad detective Whispering Smith could spawn and carry movie franchises. The third factor was the success of Edgar Rice Burroughs. In 1912 Burroughs' first two story serials appeared: "Under the Moons of Mars," in All-Story Magazine (Feb-July 1912), the first John Carter of Mars serial, and "Tarzan of the Apes," in All-Story (Oct 1912), the first Tarzan novel. "Under the Moons of Mars" was mostly ignored, but "Tarzan of the Apes" was an immediate success, and within two years Burroughs was a full-time writer commanding top rates. Burroughs was not the first author to write a Planetary Romance story (A Princess of Mars) nor the first to write a Lost Race/man-raised-by-animals story (Tarzan of the Apes). Burroughs was not even the first author to find success in writing popular examples of both. Both genres of story had been successful for authors since the late 19th century. What set Burroughs apart from those previous authors was the scale of his success and the resulting influence he had on those genres. In the thirty years after Burroughs' debut the great majority of the writers who wrote Planetary Romance and Lost Race-and-feral-children stories did so under the influence of Burroughs, if not in blatant imitation of him. Burroughs didn't invent ray guns, or aliens using human feudal structures, chivalry, and martial codes, or humans being raised by impossibly intelligent and communicative animals, or any of the other tropes and motifs (now cliches) from both type of stories which are so familiar to us now. But Burroughs so popularized the genres in which they appeared that his handling of those tropes and motifs, and those genres, became not just the standard approach but the archetypal approach to them. If the characters in Kurt Busiek's Astro City literally live and work in the shadow of Mt. Kirby — a reference to comic book artist Jack Kirby and his enormous influence on modern superhero comics — then those writing Planetary Romances and Lost Race-and-feral-children stories, even today, figuratively do so in the shadow of Mt. Burroughs. More broadly, Burroughs' approach to his stories was hugely influential in the pulps. Burroughs emphasized an efficiency of narration, a constant forward moment, and above all what critic John Clute called the "literalization of the dream," the story-as-pure-expression-of-id. More than any other writer, Burroughs was responsible for the pulp aesthetic and pulp magazine writers' embrace of it. It was Burroughs who led these writers to showcase the surface elements of traditional adventure fiction while neglecting its more thoughtful elements. And it was Burroughs who led pulp magazines and pulp editors to cater to the readers' pleasure principle — a state of affairs recognizable to any modern movie-goer. The influence of the Burroughs and the pulp aesthetic began to decline in the late 1940s and entered a low period. Film and especially television were influenced by different aesthetics, and there were few adaptations of pulp stories or uses of pulp characters. American popular culture began to change from print-dominated to visual-arts-dominated. But in the 1960s Burroughs was rediscovered by readers, with most of his novels being put back into print, and in 1977 Star Wars debuted. Star Wars was such an enormous success that has been — rightfully — credited with creating the modern blockbuster film. Star Wars was a deliberate homage to the film serials of the 1930s and is an an embodiment of the pulp aesthetic which influenced those serials. Star Wars is often charged with changing film, with de-emphasizing character and theme and putting a premium on the facile, the adventurous, and on special effects — a change felt in movies as well as in fiction, television, comics, and video games. It can also be said that Star Wars resurrected the pulp aesthetic and made it more popular and more influential than ever. Today's world privileges the visual arts over the printed arts. Film and video games are the dominant art forms. Both increasingly rely on comics and the pulps as the source of ideas and concepts, and both heavily use the pulp aesthetic. The increasing emphasis and reliance on franchises and sequels, the increasing use of print characters (fiction and comics) as the source of those franchises, the use of special effects, stunts, and action scenes as a substitute for character development — all spring from the pulps and the dime novels before them and all demonstrate the enduring influence of the pulp aesthetic, and of Edgar Rice Burroughs, who created it.